Antony Tudor (4 April 1908 – 19 April 1987) was an English ballet choreographer, teacher and dancer. Tudor was born William Cook in London. He discovered dance accidentally. He began dancing professionally with Marie Rambert in 1928, becoming general assistant for her Ballet Club the next year. A precocious choreographer, at age twenty-three he created for her dancers Cross Garter'd, then Lysistrata, The Planets and other works at the little Mercury Theatre, Notting Hill Gate, and his two most revolutionary, Jardin Aux Lilas (Lilac Garden) and Dark Elegies, before the age of thirty, himself dancing the main roles. In 1938, he founded the London Ballet with Rambert members, including his future life partner, Hugh Laing, Andrée Howard, Agnes de Mille, Peggy van Praagh, Maude Lloyd and Walter Gore. With the onset of World War II, in 1940 he was invited with them to New York, joining Richard Pleasant's and Lucia Chase's reorganized Ballet Theater. Chase's company was later to become the American Ballet Theatre, with which Tudor was closely associated for the rest of his life. He was a resident choreographer with Ballet Theater for ten years, restaging some of his earlier works but also creating new works, his great Pillar of Fire (1942), Romeo and Juliet, Dim Lustre and Undertow, on that company by the end of the war. Retiring from dancing in 1950, he headed the faculty of the Metropolitan Opera Ballet School, taught at the Juilliard School recurrently from 1950 onwards, and was artistic director for the Royal Swedish Ballet from 1963-64. He choreographed three works for the New York City Ballet. 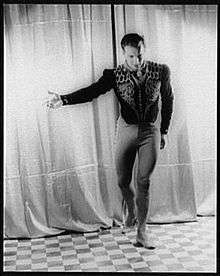 Tudor continued his teaching career as Professor of Ballet Technique at the Department of Dance, University of California, Irvine from 1973 (work curtailed by a serious heart condition), while rejoining American Ballet Theatre in 1974 as associate artistic director, creating The Leaves Are Fading and Tiller In the Fields, his last major work, in 1978. With Laing, he continued seasonal residence in Laguna Beach, California. Tudor was awarded a creative arts medal by Brandeis University, the Dance Magazine and Capezio awards, New York City's Handel Medallion, and both Kennedy Center and Dance/USA National Honors. Tudor was inducted into the Mr. & Mrs. Cornelius Vanderbilt Whitney Hall of Fame at the National Museum of Dance in 1988. Tudor is generally accepted as of the great originals of modern dance forms. Along with George Balanchine, he is seen as a principal transformer of ballet into a modern art, but of a genius that uses, rather than proceeds from, ballet forms. His work is usually considered as modern “psychological” expression, but — like their creator - of austerity, elegance and nobility, remarkably primarily using only classical forms. Mikhail Baryshnikov said, "We do Tudor's ballets because we must. Tudor's work is our conscience." A disciplined Zen Buddhist, Tudor died on Easter Sunday in his residence at the First Zen Institute of America, aged 79. Thirty of Tudor's dances have been documented in Labanotation by the Dance Notation Bureau. The scores' introductory material contains history of the dances, cast lists, stylistic notes, background on Tudor, and information needed to stage the works (costumes, sets, lighting, music). ↑ "Dance Notation Bureau's On-line Notated Theatrical Dances Catalog". Dance Notation Bureau. Dance Notation Bureau. Retrieved 12 December 2015. Chazin-Bennahum, Judith (1994). The Ballets of Antony Tudor: Studies in Psyche and Satire. New York: Oxford University Press. Perlmutter, Donna (1995). Shadowplay: The Life of Antony Tudor. NYC: Limelight Editions. ISBN 978-0-87910-189-3. Zen Notes obituary issue, 34:5 (May 1987), includes "Tudor Dies" by Mary Farkas; "Notes on Tudor" by Clara Gibson Maxwell and Suzanne Ames. Entry of Antony Tudor's Dances on the Dance Notation Bureau's On-line Theatrical Dances Catalog. Hugh Laing and Antony Tudor papers, 1911-1988 Jerome Robbins Dance Division, New York Public Library. Archival footage of Johan Renvall and Madeleine Onne performing in Antony Tudor's Little Improvisations in 1983 at Jacob’s Pillow Dance Festival.